Is Downtown Finally Looking Up? What Would It Take For Los Angeles To Have a Downtown That’s Considered World-Class? Los Angeles, a place of constant reinvention, is always reinventing its downtown. For decades, those reinventions, and various big dreams for the city center, have been dashed. But the past several years have seen perhaps the strongest, most sustained push for remaking downtown–particularly as a place to live–in a century. That progress has been accompanied by a debate over whether the changes are for the good–or whether they are unworthy of a great city. In advance of a Zócalo in Grand Park event, “Will Downtown Ever Work?” we asked Angelenos: What would it take for Los Angeles to have a downtown that’s considered world-class? We are in the midst of another of the many optimistic cycles that have proclaimed the emergence of new bustling 24-7 downtown, this one hinging on the L.A. Live entertainment complex. Like the last two, which were so hopefully centered on the opening of Walt Disney Concert Hall and the construction of Staples Center, this one will fail to meet the most ambitious expectations–even if it turns out to be profitable for its developers. Los Angeles will never have a downtown that compares with Manhattan or Chicago. Those who think it will are probably locked into a rigid and old-fashioned model of what cities are like. They also ignore L.A.’s particular history and geography. L.A. developed as a polycentric metropolis, never experiencing the 19th century industrial centralization that created the dense downtowns of Chicago and other eastern cities. For much of the 20th century, L.A. typified the low-density sprawling western U.S. metropolis, a collection of suburbs in search of a central city. Over the past 40 years, it has been changing in very different ways. Global migrations to the urban core created Manhattan-like residential (but not commercial) densities, and classic suburbia was urbanized to such levels that L.A. passed New York City in 1990 as the densest urban area in the country. This new process of what I call “regional urbanization” is also polycentric, so far producing as many as 40 cities with populations of more than 100,000 in the L.A. region. With densities increasing almost everywhere, why should the old city center grow rapidly? Investment can continue, but it is expectations about downtown that need to change. Perhaps we should just proclaim that downtown is already “world class” and get on with it. Edward Sojais professor of Urban Planning at UCLA. You’re asking the wrong question. “World class” is a subjective category that is in the eye of the beholder and is freighted with visions of grandiosity. Rather, I think it is fair to say that Downtown L.A. is increasingly becoming the live/work/play destination that many have long hoped for, and that characterizes truly successful downtowns. From a statistical point of view, downtown is the largest job base in the region. It is the center of its culture, government, and professional sports (especially if one considers USC football a professional team). And its constituent neighborhoods–South Park, Bunker Hill, Little Tokyo, the Arts District, and Central City West–have experienced a surge in residential population. Indeed, the downtown residential population has increased by 159 percent over the last 13 years, and is now estimated at 48,000. Amenities–the restaurants, stores, clubs and public spaces that bind a community together, have sprung up at a dizzying pace. 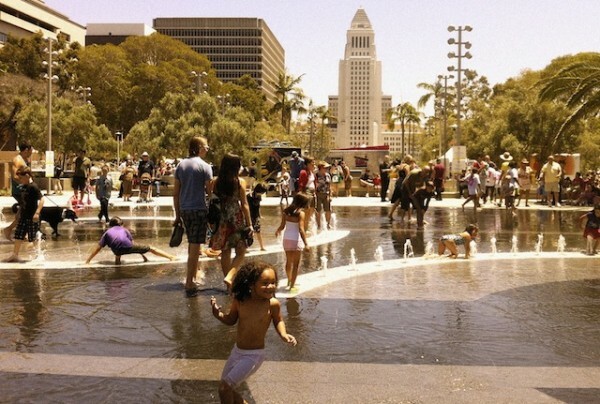 In 2011 alone, more than 104 restaurants, bars and shops opened in downtown, and the 16-acre Grand Park, which connects City Hall to the Grand Avenue cultural core, was opened to the public this July. Convention business and tourism have increased dramatically. This downtown energy has spread to the north and east, to Echo Park, Silver Lake, and Highland Park. Bill Witte is the president and managing partner of Related California. Downtown Los Angeles has experienced an extraordinary renaissance since the opening of Staples Center and the passage of the Adaptive Re-Use Ordinance by the City of Los Angeles, both in 1999. We are well on our way to becoming a world-class city. The numbers tell the story. Almost $16 billion dollars has been invested in downtown since 1999, including the construction of Staples Center, L.A. LIVE, the Caltrans building, the Cathedral of our Lady of the Angels, Walt Disney Concert Hall, the Police Administration Building, Grand Park, and the Broad Museum. More than 18,000 new residential units also have been built. Downtown’s residential population has exploded from about 18,000 in 1999 to almost 50,000 today. In addition, more than 200 restaurants, bars, nightclubs have opened. So has a Ralphs grocery store. The streets of Downtown, once dead after 5 p.m., are now busy with pedestrians, including many people pushing baby strollers and walking their dogs, morning, noon and night. Downtown is alive. All of these advances have been supported by eight business improvement districts (BIDs) in downtown that keep our streets clean and safe, promote economic development, and market Central City. Funded by property owners through a special real estate assessment that is self-imposed through special elections, the BIDs invest some $17 million in downtown’s eclectic neighborhoods annually. That said, to become a truly world-class city, we need more green spaces and charter & private schools for our families who live and work here. We need more investment of every type–retail, commercial, entertainment and residential–to achieve the critical mass that will make us a world-class downtown. Carol E. Schatz is the first woman to serve as President and CEO of the Central City Association (CCA) of Los Angeles. Downtown surely needs to reflect more accurately that it stands at the center of the second-largest city in the U.S., and of America’s gateway to the East and South. And it needs to be understood by all elected officials that downtown is essential to the City’s future, and that they must invest in infrastructure, support trade and tourism, and encourage investment. Those are big, obvious things. But what has driven downtown’s recent revival is a more subtle force–a new attitude about the nature of cities in general and downtown in particular. We are in a new age of urbanism, one that is more focused on how we live and thrive in the city. Before we become a “World Class Downtown,” my sense is we must become a “good” downtown, one that serves the people of Los Angeles. We need to be rich in cultural, educational, entertainment, and retail assets, and diverse in our population and neighborhoods. Our existing wealth in these areas has begun to change our once dormant downtown, but more change is needed. Downtown needs to be more walkable, greener, and better connected to the rest of the city’s important components (including its airport!) by efficient, high-quality mass transit. Most of all, we need 200,000 more full-time downtown residents of all income levels. I expect that will happen sooner than anyone imagines. Tom Gilmore is a Principal of Gilmore Associates, a real estate development company based in Downtown Los Angeles. He was the first developer in Los Angeles to utilize the Adaptive Re-Use Ordinance and has converted vacant buildings into more than 500 Lofts in what is now known as the Old Bank District. Downtown Los Angeles already is the primary–but not the only–hub in Southern California. And investments by the public and private sector will strengthen its position, especially in the area of transportation. Measure R is better connecting the region to downtown L.A. Metro is extending the subway to other major L.A. centers–Beverly Hills, Century City, and UCLA/Westwood–and the four light rail lines–to and from Long Beach, the San Gabriel Valley, east Los Angeles, and Santa Monica–finally will be connected. These will make access to downtown easier and more convenient than ever. Much of Metrolink’s regional commuter rail service goes to downtown, and Metro is at work on a master plan to improve Union Station. California’s high-speed rail, under current plans, would stop at Union Station. LADOT’s “Express Park” program brings real-time parking availability info to its subscribers, and uses flexible pricing so that curbside parking is at once more readily available and more often used. LADOT is building a network of bikeways in downtown Los Angeles. Bike Nation has proposed a bike-sharing program downtown and LADOT will be implementing “mobility hubs” that allow people to share bicycles and cars in certain locations. Next up is the installation of “parklets”–curbside parking spaces that can be used as public space, with seating tables, planters, and bicycle parking. These transportation initiatives by public agencies, coupled with private investment, are turning downtown from Southern California’s primary hub to a world-class center. Jaime de la Vega is General Manager of the Los Angeles Department of Transportation (LADOT). Los Angeles is undeniably a world-class city; at issue is its legibility as such. I think there is a more complex and elaborate conversation around the question of whether a world-class city necessarily must have a world-class downtown. I would assert that the answer isn’t obvious and, in the case of Los Angeles, is yet to be determined. Downtown Los Angeles is benefitting from renewed focus, investment and residents who bring with them the promise of the 24-hour environment central Los Angeles hasn’t seen since the clearing of Bunker Hill in the late 50s and early 60s. A few remarkable buildings have been added to the streetscape. A critical mass of residents-by-choice, restaurants and culture now exists, and the necessities of life can be obtained without a trip across the river or a freeway. What hasn’t yet gelled is the sense of this place as an authentic urban environment. All of the pieces of downtown don’t seem to fit together; the whole is not yet more than the sum of its parts. Los Angeles is a city that has stumbled backward into its future. The driving force in new development is, and has always been, opportunism, not strategy. This tendency underlies the city’s charming patchwork of surprising urban moments, and explains why its identity continues to remain unclear to those who require clarity from their cities. The new Grand Park provides an important example. The site was an existing cut between public buildings–a significant but problematic public space. While no one would object to the rehabilitation of the overly-paved, confused plot of land, and while there is general agreement that Grand Park presents a beautiful, badly needed green space downtown, questions remain as to how and when the park will be used. The land was available and this made the project feasible; those questions could be sorted out later. Los Angeles continues to suffer from the combination of an inferiority complex and a love affair with the wisdom of the market. Cost-effective projects are better ones, never mind if they are stripped of their vision. This explains how we ended up with a rail line–the Green Line–that travels between two small towns, Norwalk and Redondo Beach, and stops short of LAX. Projects won’t contribute to downtown Los Angeles as a world-class entity if we conceive them while looking only at costs and local needs, aspiring to nothing more than solving problems. Chava Danielson is an architect at DSH // architecture and an Adjunct Professor at Otis College of Art and Design, teaching design studio and urban history and theory. She serves as co-chair of the Political Outreach Committee of the AIA-Los Angeles.